When you learn how to relax while running, you will be able to consciously recognize and remove the stress and tension that often occurs during a run. Tension promotes injuries and draws energy from our bodies. We often tense our bodies without realizing that we are doing it. The next time you go to the dentist, pay attention to how your body feels in the dentist's chair. Are you tense or relaxed? 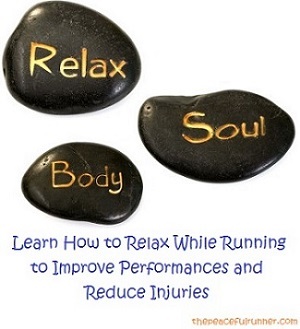 Studies show that relaxation can improve running performance and running economy. According to Wikipedia, "Running economy is a measure of how efficiently a person uses oxygen while running at a given pace." At the end of a six-week training experiment using relaxation techniques, runners had lower heart and ventilation rates and lower VO2 consumption. Practice relaxation techniques while running and you will be able to run further and faster using less effort than before. Staying relaxed when running can improve your running performance, but there are other reasons why runners need to relax. A relaxed body promotes a relaxed mind. It is in this state that you can more easily achieve "runners high" or you can "get in the zone." Many runners have experienced this flow state - the feeling of effortless running - the high that has attracted so many runners. There are numerous relaxation exercises you can use to learn how to relax when running. The simplest one is just to contract and relax all your major body parts, starting with the feet and ending with the parts of your face and the top of your head. When a muscle is tightened for a few seconds and then released, it becomes more relaxed than before. Start by lying or sitting down and breath deeply in through the nose and out through the mouth. Focus on your breathing for a few minutes and then tighten both your feet as much as possible. When the feet are tightened, focus on the muscles and feel the tension in them. When you release the tension, notice how relaxed your feet have become. Continue to move up your body. Tighten and release the calves, upper legs, thighs, buttocks, stomach, back, hands, arms, shoulders, throat, jaw, face and eyes. Don't forget the jaw - it is a common place to hold stress. When you are finished you will feel totally relaxed - it is a great exercise to do before going to bed. With practice, you will be able to recognize this relaxed feeling and maintain it while running. During a run take a moment from time to time to scan your body for tension. You will be able to consciously relax any part of your body that feels tight. Do you remain relaxed when you are running up those hills? Do you feel any tension in your shoulders or chest? Become aware of how you feel at times when you are using more effort. You can still train hard and fast and stay relaxed at the same time. Are you nervous about slipping and falling? If you do fall, the nervous tension you are holding in your body increases the risk of injury. Relax, so that even if you do fall, the risk of injury is greatly reduced. Also, remember to smile - it will relax your face. Some runners use a breathing pattern to help them practice running and relaxation. Tension often creates irregular breathing patterns. While breathing in, take two steps. Then breath out and take two steps. This will help regulate your breathing and keep you relaxed. Try talking to your body. Tell it to RELAX! This can be most beneficial when you feel a tightening in one particular area, such as the knee, hip, or IT band. Direct your focus to that particular area and consciously help it relax. Our bodies are very obedient and will listen and respond when we give them focus. Try these Relaxation Exercises for Runners to get you on your way to becoming a more relaxed and tension-free runner.